All summer kids and adults alike had opportunities to read, read, read for chances for prizes in the annual Carnegie Public Library’s (both Washington Court House and Jeffersonville locations) Summer Reading Program. Some of Jeffersonville Branch Library’s Summer Reading Program prize winners were Annabel Smallwood, King’s Island tickets, Gabriella Webb, Newport Aquarium tickets and Jaden Allen, a large pizza from Pizza Hut. https://www.recordherald.com/wp-content/uploads/sites/27/2017/08/web1_srp-winners.jpgAll summer kids and adults alike had opportunities to read, read, read for chances for prizes in the annual Carnegie Public Library’s (both Washington Court House and Jeffersonville locations) Summer Reading Program. 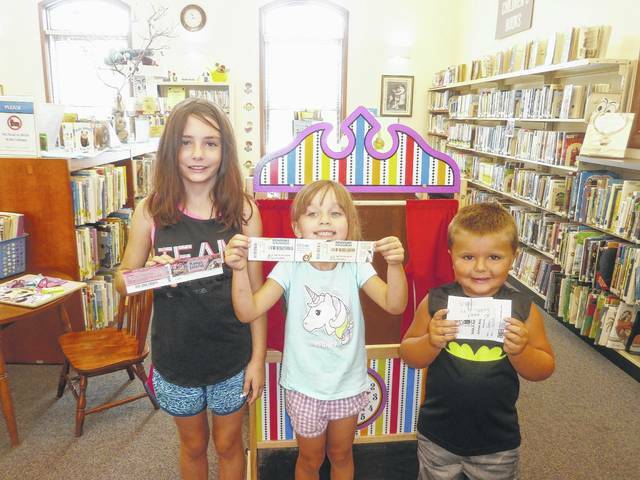 Some of Jeffersonville Branch Library’s Summer Reading Program prize winners were Annabel Smallwood, King’s Island tickets, Gabriella Webb, Newport Aquarium tickets and Jaden Allen, a large pizza from Pizza Hut.